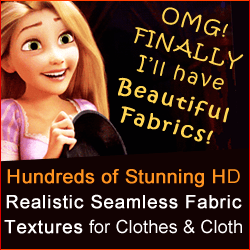 Free Marvelous Designer 6 Video Tutorials & Review of ALL New MD6 Features! In these Marvelous Designer 6 review, you’ll learn all about all the new features in Marvelous Designer 6 and we’ll go through a detailed review of all feature updates in the new Marvelous Designer 6 software. From these free Marvelous Designer 6 tutorials, you will learn the best creative and most effective ways how to use the new features in Marvelous Designer software version 6 when creating dynamic 3d clothes for your projects. In Marvelous Designer 6 we can now easily create buttons of various shapes as well as button-holes. You can customize the buttons; control the size and weight of buttons, change the colors, textures, angle, and sewing position. Buttonholes can also be customized to some extent. MD6 provides several buttonhole and button presets which suffice for most needs. Super cool new feature! It’s easy to create buttons and buttonholes at an exact same distance from each other. You’ll learn in this 38 minute Marvelous Designer 6 buttons video tutorial all about buttons & buttonholes, the best way to make them and best practices of how to customize them. In Marvelous Designer 6 we no longer have to copy a pattern and then symmetric paste it, we can save ourselves the copying step and simply right-click on the pattern and select “Clone as Symmetric Pattern (with sewing)”. Another cool Marvelous Designer 6 new feature is we can now apply Symmetry automatically to multiple patterns! In this free Marvelous Designer 6 tutorial you’ll learn all about the new “Offset Pattern Outline Feature”, which is is another interesting feature in MD6. Discover how to use it for different creative designs. Now there’s no excuse anymore for having a mess in your 2D pattern window! In Marvelous Designer 6 we’ve got some new Align & Distribute options which lets us quickly get our pattern pieces out of any mess they might be in, and nicely aligned. You can align segment points, internal lines and points of internal lines, as well as patterns. Watch the tutorial below. OK, so you’ve tugged, pulled and arranged your wrinkles to perfection on a specific Marvelous Designer clothing pattern for a certain pose, and wish to keep all the folds and wrinkles perfect during simulation. That used to be a big issue. At times a Battle. Now finally the new Marvelous Designer 6 feature called ‘Solidify’ enables you to pretty much “freeze” your great looking wrinkles, so when you animate the clothes or simulate the garment, those wrinkles on that specific pattern don’t ever change! This will save you so much time and nerves and for some of you – sculpting those extra wrinkles in ZBrush. The new Marvelous Designer Steam feature is positioned as a great way to flatten out undesired wrinkles or lumpy areas of your clothes. Well, it’s actually not a magic pill. What it basically does is either shrink or expand parts of your cloth (like a local shrinkage weft/warp operation). You can use it instead of elastic bands to cause any part of the cloth to bunch up like an elastic gathering effect or thicker waistband. Somewhat like if you took a real-life iron and pressed it on a plastic material like Polyester at high heat… It makes this Steam tool quite useful. It makes this Steam tool quite useful. With the usual method of creating elastic waistbands with an internal line, results in a thinner elastic band effect, while using the steam tool can create a wider gap between the gathers. Watch this tutorial to learn all about the Steam feature in Marvelous Designer 6! Another very useful feature in Marvelous Designer 6 (which I requested a while ago) is the ability to delete individual Avatars and Props instead of having to delete ALL Avatars/ Props as in previous MD versions. Marvelous Designer 6 also records in the History actions to do with Avatars and Props, such as moving the Avatars, even just Selecting them, adding/ deleting Avatars/ Props etc. So if you by mistake delete for instance a zipper puller you finally got into the right angle and position, you can always undo that now. This new Marvelous Designer 6 feature makes it easier to select patterns which have many 2D graphics overlaid on them (such as stitches, text, decor etc.). Previously, it would be impossible to scale a pattern covered in 2D graphics. In MD5.5 if you scaled it and the graphics went out beyond the pattern edge, Marvelous Designer would block the action. Now you can scale, stretch, distort to your heart’s content. Watch this Marvelous Designer 6 feature review tutorial below. With the new Chalk tool you can draw guidelines directly onto your clothes in the 3D Garment Simulation Window. Watch the video tutorial to learn what can be done with the new chalk tool in Marvelous Designer 6 and how to create chalk line, turn chalk lines into internal lines and internal shapes and delete chalk lines. In Marvelous Designer 6 you can speed up or slow down the cloth animations you recorded in the Animation tab. Watch this free Marvelous video tutorial on how to use Animation Time Warp feature. You now have the ability to crop your textures to a specific pixel size when exporting your garment and saving out surface textures. When you edit the UVs of your clothes you can now see the piping lines and change their position on your UV map. Improved: Move Garment to Start Position. When you import an animation (walk, run, whatever) for your Avatar, you need to transition him from T-pose/ A-pose to the start position of the animation. MD previously already had the ability to create a transition animation, and now they’ve improved on it further. Delete ALL Curve Points on a pattern (previously you had to delete one by one – agony!!). To delete all curve points, right click with your edit curve point tool on one curve point and select “Delete All Curve Points”. Ta da! Leave a comment here below if you have any questions or remarks about the new features in MD6 and let us know how you use these features and tools, or if you have any suggestions to share or insights to add to this Marvelous Designer review of new features. Subscribe for more Marvelous Designer videos and like our Facebook page for contests and updates. If you need to learn to make dynamic 3D clothes consider our Marvelous workshops or full Mastering Marvelous Designer training program. 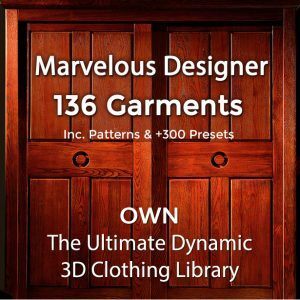 We also provide Marvelous Designer clothing templates to significantly speed up production time as well as a gorgeous seamless fabric texture library for 3D cloth. Hi Sylvie, thanks and MD now have on their homepage a popup about this issue they are having with Mac OS. We made the big mistake of buying an iMac some 3 years ago. A terrible machine albeit excellent screen. Not good even for Photoshop these days. Using the Windows on it is best way to get it functioning better for 3D software, but then issues getting the software makers, such as ZBrush, to support. They actually will not provide any support. Best use a Windows OS powered machine and goodbye Mac. I use iClone and I love the freedom Marvelous Designer gives me in the ability to create my own clothes for characters. My problem is, once inside Character Creator they are too stiff and the model breaks through in various animations that I employ. I’ve had some success by creating Weight Maps, but I wondered does your course contained something that I might have missed? If you have a solution to how cloth behaves in Reallusions iClone and Character Creator in your Advanced training – then I will happily make a purchase but I don’t want to buy it if it doesn’t solve my problem (I can already use MD). I am using Marvelous Designer 7 on a Windows 10 computer. Sorry, our Mastering Marvelous Designer training only covers how to use MD software and create clothes in MD. We do not teach how to rig clothes for other 3D programs. I hope you find the solution you need!